When Rebecca Sawyer, a reporter in Las Vegas, is sent out to a small town in rural Nevada to cover a breaking story about a cattleman squaring off with the Feds, she meets a shy rancher named Wyatt Washburn. His wife died three years ago and he hasn't been able to put away his grief. Danger pushes the two of them together but they're seemingly opposites. She's headstrong and confident, where he's reluctant and wary. Their accidental relationship is touch and go from the start and could be over before it begins. 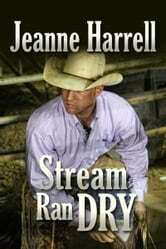 Wyatt invites Rebecca to spend a week with him at the ranch to see if they can build their fragile relationship. It becomes overwhelming for Rebecca when Missy, Wyatt's deceased wife, becomes the third person in the triangle. Missy is everywhere because Wyatt seemingly can't get past her to have a future with Rebecca. So is this it? What will it take for Wyatt to put aside his grief? When Rebecca's out of moves, she heads back to Las Vegas without him. It was never going to work anyway, so why not cut her losses before she's in too deeply. But fate steps in and with the magic of shooting stars, anything is possible. Is it really possible to get what you truly want?